Distributing the body’s weight within the pillow a pregnant woman is using, causes ease of pain in pregnancy. That is why the Junior Size - Total Body Pregnancy Maternity Pillow is made bigger and larger to address these issues with pregnant women. 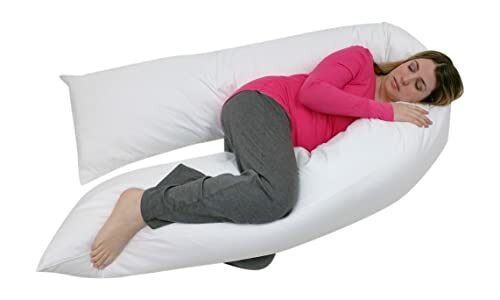 This body pillow does not only absorb the increasing weight of pregnant women overtime, it also cushions body parts that are prone to swelling and aching during pregnancy. The everyday use of this pillow also increases the chances of healing the bad effects of growing tummy by healing it mentally and psychologically through better sleep. A body pillow is a kind of pillow which is oversized (compared to conventional kinds) and contrary to a standard-size pillow, this type could provide extraordinary comfort, healthful reliefs and more relax night’s sleep. These pillows are basically mattress-size, some come in different shapes and usually mold to the contour of your whole body giving utmost comfort. Using standard-size pillows usually needs more than one in bed where sleepers use them one in the head, one in the back or another in-between the legs just to cushion these body parts. The body pillow takes the role of one for multiple ones. Moreover, manufacturers are being scientific in designing these pillows in recent years, like the Junior Size – Total Body Pregnancy Maternity Pillow where essential and therapeutic effects are being considered. This pregnancy pillow is designed to protect women on the family way. Designed and developed by Blowout Bedding, this pillow is primarily produced to cater to pregnant women. This Junior Size version is slightly smaller than the Over-size counterpart but has almost the same benefits for users. The Junior Size – Total Body Pregnancy Maternity Pillow is an ergonomically designed body pillow which is made practically with the pregnant women in mind. This maternity pillow is so much different from ordinary pillow because using only one of this could cover the vital parts of the body for soft cushioning against pains and aches associated with pregnancy. The tummy is also well supported during sleep (or just napping), mom should not worry having their stomach pinned down when sleeping because of the softness of this pillow, and it would be gently caressed. The pillow’s filling is made from 100% chemical-free polyester while its exterior is super soft white cotton fabric and is also chemical-free. Its cover is poly/cotton and pre-shrunk at the factory. The cover is removable and washable with mild detergent in warm or cold water. Additionally, it could be tumbled dry in low heat and should not be bleached. The fabrics use in this product is certified not harmful to the skin of both mother and child. This junior version is shorter by 15 inches on either side in comparison with its Over-sized “big brother”. At 19 inches thick and each side is 50 inches in length, the pillow is still categorized as “big” compared to conventional pillows. But this size makes it more convenient and comfortable in easing pains and absorbs the increasing weight of mothers while pregnant. The Junior Size – Total Body Pregnancy Maternity Pillow is created with lofty texture which enables soft cushioning. Pains at pressure points such as joints, neck and back and the different parts of hips and legs are totally protected. The use of this pillow could also decrease the chances of experiencing those aches and pains for younger users who don’t experience these symptoms yet. For younger users, this high-density pregnancy pillow is just a way out from perennial body pains. Being lofty is really being soft. The soft texture of this pillow and the elevation of the head and body cushioned in tender pillow could give the troubled sleepers (especially the pregnant ones) the proper alignment of the the vital parts of the body causing total relaxation and utmost convenience while sleeping. Although this pillow is much bigger than conventional types, it is still lightweight at 4.9 lbs. considering its size. The filling material for the interior of the pillow is re-engineered to make light but durable and soft. The pillow could be carried everywhere when folded properly. Fits in a Queen-size Bed together with Husband & Wife: Husband and wife team should not be intimidated by the size of this pillow compared to ordinary pillows. It is observed that the 3 could sleep together in a Queen-size bed without the hassle of overcrowding. Both could move freely while dreaming. Zippered Pillow Case: The pillow case that comes with the package is zippered and sewn to an almost seamless manner. The zipper is made from durable materials and is machine washable but not for multiple cycles. One or two cycles in the machine is enough to freshen the fabric. Also Convenient for Every One: Primarily designed as maternity pillow, anyone (pregnant or not, men or women) could still savor the great therapeutic effects this pillow could provide. Cylinder Shape: Unlike letter-shaped body pillows, the Junior Size - Total Body Pregnancy Maternity Pillow is a cylinder-shaped pillow where it could be bent on any segment where sleeper is convenient. Spare Cover Sold Separately: Unfortunately, only one pillow case is provided on the package free of charge. If you want spare, you could order from your dealer, parts body number could be seen on its user’s manual. Blowout Bedding is one manufacturer that gives sympathy to pregnant women who wants to provide them with the best body pillow they could own and treasured for the rest of their lives. The full-body support the Junior Size – Total Body Pregnancy Maternity Pillow can provide cannot be provided by ordinary pillows. Its immense size is truly worth every penny and also much beneficial against using multiple pillows. Healthy living is not just eating healthy foods but also sleeping gloriously and comfortably. Picking this pillow will not be your regrets in the future.